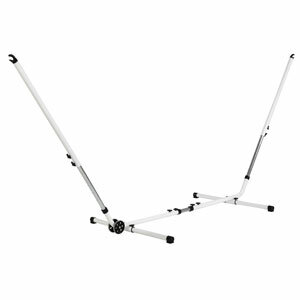 These pair of hammock stands are ideal for suspending your hammocks or hammock chairs. The hammock stand is supplied with a pair of wheels for easy transportation, once assembled. The frames are built to hold 120Kg. Please Note: Hammock Stand is only available in white and Hammock Chair Stand is only available in grey.